Preheat the oven to 350°. Set the cookie dough in a 9-by-13-inch baking pan. Place a sheet of plastic wrap on top and evenly press or roll the cookie dough to fill the baking pan. Remove the plastic wrap and bake the cookie for 14 minutes, until lightly browned. Let the cookie cool completely in the baking pan. Invert the cookie onto a work surface and slide it back into the baking pan, bottom side up. Trim the edges if necessary. Scoop the vanilla ice cream over the cookie in large dollops. Place a sheet of plastic wrap on top and press or roll the ice cream into an even layer. Freeze for 1 hour, until the ice cream is just firm. Remove the plastic wrap. Drizzle the warm chocolate sauce all over the ice cream. Cover again with plastic wrap and freeze for 1 hour longer, until firm. Invert the baking pan onto a cutting board and tap gently to release the cookie bar. Flip the cookie bar over so it is ice cream side up. Using a sharp, heavy knife, cut the bar in half crosswise, forming two 9-by-6 1/2-inch rectangles. Sandwich the cookie bar rectangles together and press hard to seal. Wrap in plastic and freeze for at least 1 hour, until firm. In a bowl, combine the almonds and toffee pieces. Using a sharp, heavy knife, cut the ice cream cookie into 16 bars. Press one side of each bar into the almond and toffee mixture. Return the bars to the freezer or serve right away. 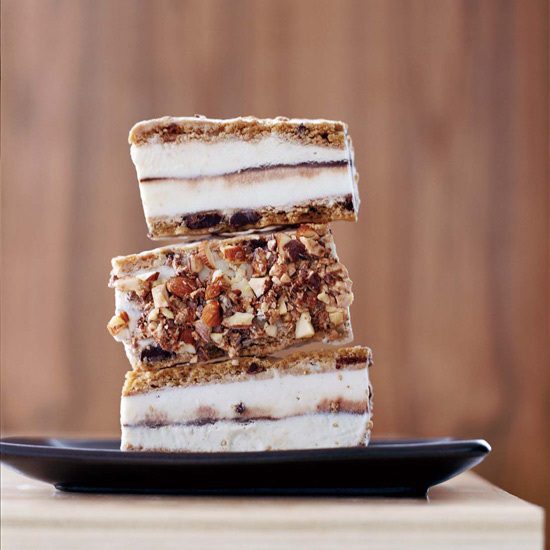 The ice cream bars can be stacked and frozen in an airtight container for up to 2 weeks.